The rest of the country can have every other holiday throughout the year. Sleigh bells don't mean much to us in the Sunshine State. So in LA, we've got dibs on Halloween. A few years ago back in New York, I started predicting that Halloween would eventually rise to the level of Christmas—expanding beyond one night of costumes and candy and grow into an entire season of celebration, replete with black tinsel trees and skeletal ornaments and garland and lights. It's been slow, but it's been happening. Or is that just my perspective because I now live in LA—a town full of set designers and decorators, special FX artists, and animators who choose to use their talents on their own lawns? LA has a few "Christmas streets," those places you go to drive or walk through all the pretty lights while neighborhood kids sell you cookies and cocoa. But this year, I discovered that we also have a "Halloween Street." Unlike the houses that display Santa sleighs for several weeks in December, those on Alegria Street in Sierra Madre gear up for one big night: October 31. I visited to catch a sneak peek on October 30 and witnessed homeowners toiling away in their yards, workers rigging up set pieces, and a voice calling out, "We're not done yet! Come back tomorrow night!" So for anyone without plans on Halloween night, Alegria Street seems like a sure thing. But why not let the rest of us enjoy it for a few days more? Why put all that work (and money) into the garden graveyards and front lawn funerals for just one night? Isn't it time we acknowledge October as "Halloween Month"? I know families go trick-or-treating in Angelino Heights and at the Spadena House in Beverly Hills, and I know about a few individual home haunts throughout Central LA and its surrounding valleys, but are there other "Halloween Streets" I don't know about? People often ask me how I get into all the places I visit. I think they assume I'm always trespassing. Not so—I try to get permission as often as possible. I never break in, though I'll walk through an open door. Sometimes, an opportunity presents itself to visit a creepy old building with a team of paranormal investigators. I'm hoping to see the building more than the ghosts who inhabit it, but I'll take what I can get. I'm not a ghost-hunter myself. The ghosts seem to find me just fine, without me having to look very hard for them. So I think it's kind of funny when investigators try really hard to make contact with the spirit world, like during our visit to the former Ritz Hotel in Santa Ana, California the other night. The hotel had been featured on the TV show Ghost Adventures, though when its crew arrived to record the episode, they were surprised to see the upper level rooms demolished—the wallpaper, the walls, the doors all gone. Now it's almost entirely gutted, but that doesn't mean the ghosts are gone. Construction activity tends to stir them up, just like mice. As I listened to the paranormal investigators recite a litany of requests to try to draw out a presence, I felt bad for the spirit world. We curious humans are so damn demanding. "Can you make a noise?" "If you're here, turn the blue light off." "What's your name?" "Do you remember me?" And everyone's so busy trying to interpret garbled messages being transmitted which may or may not be electronic voice phenomena that no one is really listening. I'm sure the ghosts knew we were there. We didn't have to make our presence so obvious. We didn't have to be clomping around so much, flashing lights and talking about goosebumps and cold spots. Why couldn't we just be silent, and wait? 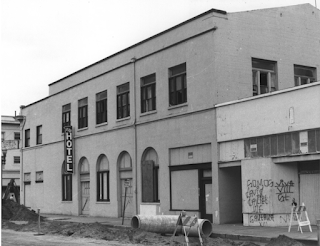 Generally, I think any energy that remains in an former hotel (and brothel) in a century-old building will make itself known when it wants to, when it has something to say. Maybe it's camera-shy. Maybe it's diurnal. Maybe it just doesn't like to be told what to do so much. And if it did have something to say—if it did have something to tell us—how would it have gotten a word in edgewise? Mountain View Cemetery started out as a family cemetery—a plot of land set aside in 1882 by Levi W. Giddings, where he could bury his family members. And it's still kind of a family cemetery, run by descendants of Giddings. But a lot more people than just Giddings family members are buried here now, in this expanse of green on Fair Oaks Avenue, in the hills above Pasadena. After all, our planet's ground is crowded. We're running out of room to bury our dead. ...and even Superman himself, George Reeves. These days, the famous graves at most cemeteries tend to eclipse those of beloved mothers, fathers, and babies who passed somewhat more anonymously. It's nice to think at Mountain View, the cemetery isn't just a money-making business. It feels a little less commercialized than you may find other, modern, franchise facilities. ...but it still feels small. ...and surrounded by an arboretum of trees of palm, pine, oak, and eucalyptus. ...and bits of blue peeked out from behind the white puffy clouds. ...and some of their petals were scattered around headstones, but it still felt like fall. I knew it was fall, because I was losing light at only five o'clock. ...and those end-of-year dark clouds started setting in. And I felt in a hurry, with that fading light and those growing shadows, and the caretaker who swept the pathways and waited for my exit to lock the gate. But I wasn't quite ready to leave yet. I wasn't ready to accept the close of the day or the end of yet another adventure, so I sat in the parking lot as the low angle of the sun briefly made it brighter and more golden than it had been before. And in that golden hour, I saw the beauty of the changing seasons and the passage of time. I understood how sometimes things in life are most golden right before the end. And when I finally left, I felt older than I had when I arrived.